Penne, tagliatelle, fettucine, fusilli, conchigliette, penne, macaroni are just some of the common types of pastas available readily in the market. I still have to come across a family which does not relish pasta. Pasta has become a common dish world over. My family loves pasta,definitely not the overcooked and mushy style! Making pasta practically every week is a challenging task if you don’t want to stick to the common tomato or white sauce variety week in and week out. Use any type of pasta you like. And please for goodness sake don’t over cook them. Most packets include the cooking time so follow it. Can use any type of vegetable that you like. I usually pick what is available in the market in Mombasa. You can use peppers, mushrooms, french beans, broccoli etc. Cut the vegetables into chunks. for 4 servings … generous helping! To make the sauce, put the tomato, spinach, herbs, fresh cream, salt and sugar in a pan and heat it gently till it becomes hot. Remember to stir it occasionally. When simmering, add the cheese and mix well. Cook the sauce till it becomes thick. Add pepper and leave it on the side. Put about 6 cups of water to boil in a big pan. When it starts to boil, add the pasta, salt and oil to it. Cook the pasta till its done, stirring it occasionally. This will take about 10 to 12 minutes depending on the type of pasta you use. Pour the contents into a big sieve and run water over the pasta. In a pan heat the olive oil, add the garlic paste and vegetables. Cook the vegetables over low heat and covered till done. Add the 1/2 tsp salt and mix. 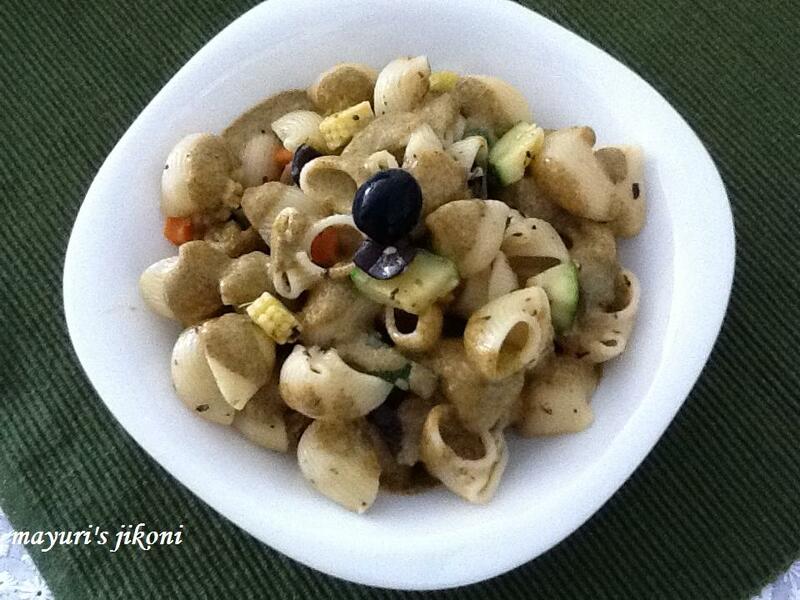 Add the pasta and olives and mix well. To serve, either leave the hot sauce on the side or mix it with the pasta.